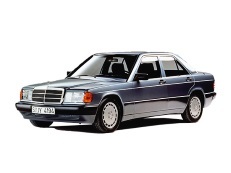 Correct Wheel Sizes, PCD, Offset, Rims and Tire specs for Mercedes-Benz 190 series. Hi, yogesh,The stock wheel size for 190 e 1993 models is 8.2Jx17 ET34,bolt pattern is 5x112,So you‘d better use both 4 wheels 17*8.5J. I have a 1991 190e, will a 18 rim fit the car? Hi,Tony,What the 18'' rims offset and bolt pattern?I can help you confirm it. Well I haven't got a rim just yet, cause I didnt know if they would fit. What do you recommend? I'm about to buy CLK 320 rims for my 1991 190e 2.3 8v, but I don´t know if they´ll fit. They are 7Jx16H2 front and 8Jx16H" rear. Has some one used these before? Hi, Ed,Can you show the bolt pattern and offset?I can help you confirm it. I can't post pictures, but you can look at them here https://rover.ebay.com/rover/0/0/0?mpre=https%3A%2F%2Fwww.ebay.com%2Fulk%2Fitm%2F263996171436. Thanks for your help.